As the RAWkin Juice Raw Vegan dessert chef and inspirational leader Angela uses her celebrity as the ‘icon’ “Felicia”from the film “Friday” to inspire and educate others on the benefits of eating raw fruits and vegetables. Angela presents a positive role model for self-transformation through the power of healthy lifestyle. In her real life Angela has enjoyed two decades in the entertainment industry as a fashion model and comedian. Angela’s gaining and losing nearly 50 lbs. 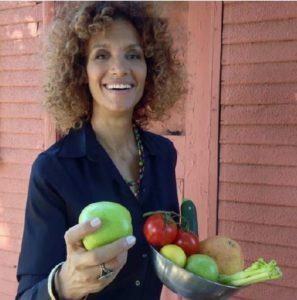 by eating a raw vegan diet that includes juices and smoothies inspires her to share her message of healthy eating with as many others as she can reach. 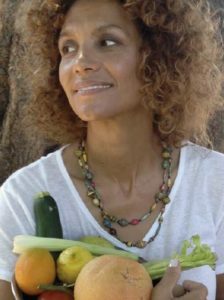 A country girl raised on a 175 acre farm, Angela has enjoyed fruits and vegetables her entire life. As a fashion model she walked the runways for the likes of Bill Blass and Bob Mackay so her weight was her life. Later as a comedian in the early 90’s she gained international fame as the character of Felicia in the cult classic film, ‘Friday’. Angela left the industry to become a stay-at-home mom. After her son left home for college Angela found nutrition and wellness to be where she wanted to contribute and create. 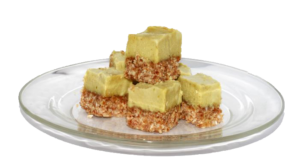 Angela uses only organic, whole foods to create her delicious treats for you. It’s important that Angela uses no sugar or syrups, only organic dates sweeten her desserts. As a mom, Angela encourages others to share so everything from RAWkin Mama comes in bites. This also promotes portion control. So far, Angela’s line has Key Lime Pie bites, Carrot Cake Bites, Tapioca Pudding and Sea Salt Caramel Turtles.